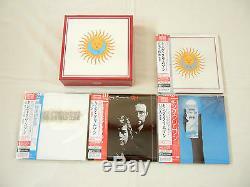 King Crimson 4 titles Platinum SHM-CD+DVD-AUDIO Mini LP + "Larks' Tongues in Aspic" BOX SET VOL 2!!! Each title is Platinum SHM-CD + DVD-Audio - 2 discs set. Those are 7 inch x 7 inch size paper sleeves!!! 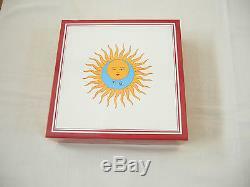 (discs are regular size) Box can hold those large size Mini LP CDs. Platinum (Pt1000) reflection film Turquoise blue label disc HR (High Resoluttion) cutting "SUPER HIGH MATERIAL CD" can play on all CD players! CDs and box are made in JAPAN. Box is an officially sanctioned release. ALL CDs are FACTORY SEALED, brand new condition. Larks' Tongues in Aspic (1973) Starless and Bible Black (1974) Red (1974) USA (1975). 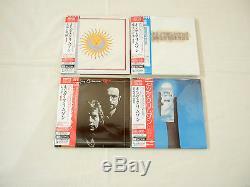 The item "King Crimson JAPAN 4 titles Platinum SHM-CD + DVD-AUDIO 7Mini LP SS + BOX Vol 2" is in sale since Sunday, May 15, 2016. This item is in the category "Music\CDs".